Because the world is round and rotates creating day and night the question becomes: when does the day start and where? 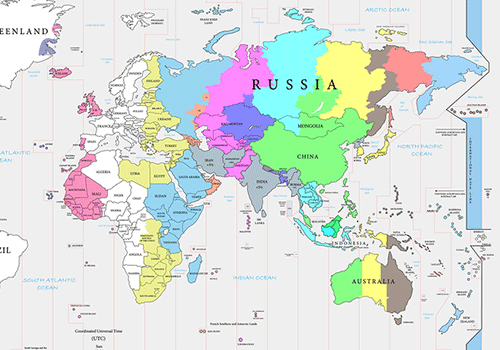 To fix a time – and consequently a date – it was decided in 1884 to establish the International Date Line at 180 degrees longitude from zero which is at Greenwich, England. This is an arbitrary “imaginary” line which stretches north to south through the middle of the Pacific Ocean, with a few zigzags to accommodate land masses that it might otherwise intersect. Samoa and Christmas Island celebrate a new day first in the world. When you are stationary, at a fixed address, it is not something one ever ponders. 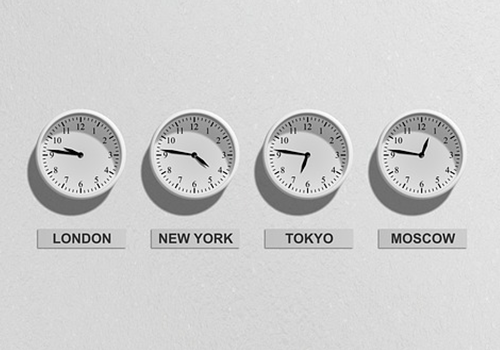 Only when you travel (or long-distance call) does that time difference ever seem to intrude on our busy lives (one hour less for every time zone to the west, and the opposite going eastwards). There are two special events in travel concerning designated arbitrary lines on the globe: crossing the Equator which separates the Northern and Southern Hemispheres and crossing the International Date Line. The latter has some unique peculiarities. Crossing from west to east, you will “lose” a day; crossing from east to west, you gain a day or get to experience the same day “twice” – whichever way you wish to embrace the notion. While not such a great deal is made of this if you are flying across the line, crossing it on a ship can be quite a different story. Historically it has been a great deal for navy and merchant marine seamen with traditional “initiation” ceremonies designed to increase morale and reduce monotony of the long days at sea. So, is it the same if you are cruising? Maybe. It depends on the cruise line. While none of them schedule events approaching a navy ceremony, some do “celebrate” it for guests with silly antics such as throwing the Captain or Cruise Director in the pool, or as un-imaginary as issuing “official” certificates. With others, it is a mere announcement the mark the moment. This under-stated practice contrasts with the often elaborate Crossing the Equator ceremonies offered by many cruise lines which include invoking Neptune’s permission. So, if you are planning a cruise across the Pacific and the date line, be prepared to make your own fun just in case. Or ask your travel professional what ceremony your cruise has planned, if any. If you are considering one of these long cruises – as crossing the Pacific from Hawaii to Asia or Australia is about five thousand miles – think ahead to what you can do to celebrate this “timely “occasion. Combine it with a special event such as birthday or wedding anniversary. 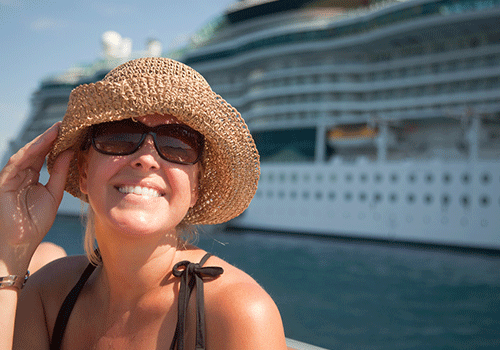 Depending on the dates of the cruise, you may get lucky and celebrate the special day twice. Or conversely, If it is a milestone birthday you would prefer to forget, consider going west to east and you might miss the day altogether! One more point: if you are thinking because you either lose or gain a day that a cruise that crosses the dateline is more economical, it is of course not valid as this issue is factored into the fare. But on a momentous occasion cruise like this, do you really care? 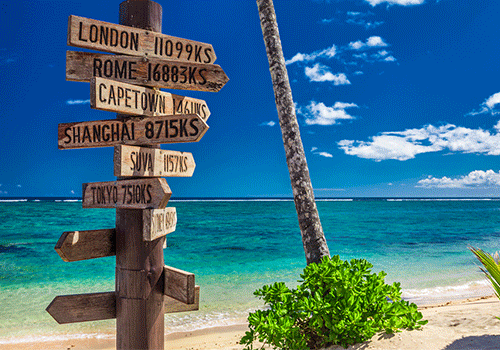 You’ve joined the travel club of those who have crossed the international date line. Feature photo courtesy of Bigstock .